This web page provides general information on Hepcats and some out-of-town events in a monthly list format. The out-of-town events listed are ones Mike & Mary have either attended or heard good things about from other Lindy Hoppers & Balboa dancers whose opinions we trust. Note some Lindy Hop events may also have classes & competitions for Balboa, and perhaps Collegiate Shag, i.e. Camp Hollywood. This is not an all inclusive list….check out the Swing Planit web site for info on swing dance events all over the world (and even that web site is probably not all inclusive). Note: Caveat emptor! Hyperbole is rampant and commonplace these days, especially in swing dance event promotion on FB, on event web sites, etc. Words and phrases like “awesome”, “amazing”, “fantastic”, “coolest ever”, “legendary”, “fabulous”, “incredible”, “super amazing”…… are so vastly overused those words have almost lost any real meaning. It’s a real challenge separating fact from fiction in swing dance event promotion – – so buyer beware! You can also check out our “What’s the Scoop?“ feature. Info provided only as a service to web users; no other info expressed or implied. See the event web site and/or contact the event for full details. o Fri., May 3: Nobody Could Hurt Like Hank, Renfro Valley, Mt. Vernon, KY. A show about the life of Hank Williams. 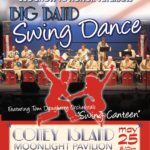 o Sat., May 25: Coney Island USO Big Band Dance and USO show. o Sat., June 8: Swingin’ on Short, Lexington’s annual street dance. o June 13-16: the All Balboa Weekend – a must attend event for Balboa enthusiasts. Keep an eye out for Hepcats next series of classes in the Fall. o Friday, May 3rd: Nobody Could Hurt Like Hank, a show about the life of Hank Williams. Renfro Valley, Mt. 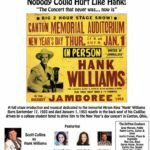 Vernon, KY.
A note from Mike & Mary about this event: Hank Williams was a unique talent. Often called the father of country music, Hank Williams was a superstar songwriter, musician and performer by the age of 25, and dead by age 29. He influenced not only county music but much of the popular music of the 1950's and early 60's. Many of his songs were covered by mainstream artists of his era; artists continue to perform and cover his songs to this day. Williams lived a short, reckless and troubled life, reflected by the lyrics and emotional appeal of his songs. Come see this fun and informative show about his life. For this production, Mike & Mary will dance on stage for a couple of songs, plus Mike will be the emcee for the show! Get on up to Coney Island in Cincy for the Cincinnati Warbirds USO Swing Dance & Salute to Veterans, music by the Tom Daugherty Orchestra, featuring their re-creation of the Glenn MIller Army-Air Force WW II band. A fun, and patriotic event to attend. o Sat., June 8th: Swingin' On Short, Lexington's annual street dance! o All Balboa Weekend (ABW), 2019 - June 13-16. A must attend event for Balboa enthusiasts! o Thursday, July 4th: Happy Birthday to the greatest county in the world! o Aug. 1-4: Cincy Lindy Exchange. See their web site for all the info. o Sat., Aug. 10: Cincy Museum Center 1940's day. More info to follow. o Sat., Oct. 19: More info to follow on a possible very special event! o Sun. Oct. 27: Hepcats Fall 2019 classes start! More info to follow.